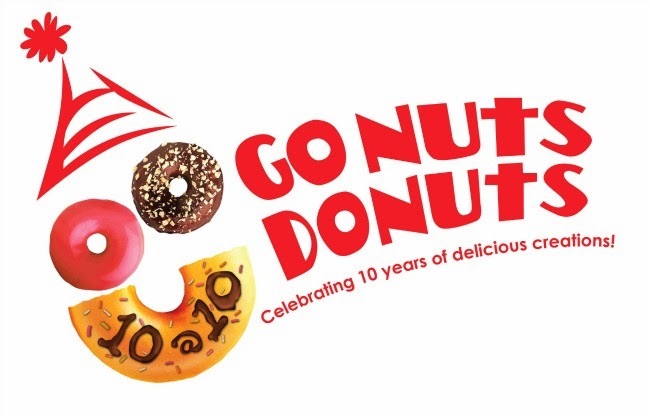 go nuts donuts celebrates 10 years with raffles everyday + more! First up, 10 new anniversary donut flavors to commemorate each successful year of business. Choose from: Strawberry Sunrise, Green Tea, Peanut Butter Caramel, Chocolate Mint, Hazelnut Crunch, White Chocolate Glaze Lite, Sea Salt Caramel, S'mores (love! ), Mocha Lite and Lemon Curd. Not to be outshined are their own brand of Cro-Nuts which come in 6 flavors. They're huge and delicious...just the way I like it! And here's something to get you donut nuts excited, for 10 days only, Go Nuts Donuts is rolling back their prices to what they were 10 years ago! Get them donuts for only P15 each from November 8-17, 2013. Social media fans of Go Nuts Donuts get to win prizes everyday from Bioessence, Dermcare, Calayan Secrets, Enchanted Kingdom, Manila Ocean Park, Bangs by Tony and Jackey, Nail Spa, Posh Nails, Simmian Manila and David's Salon! 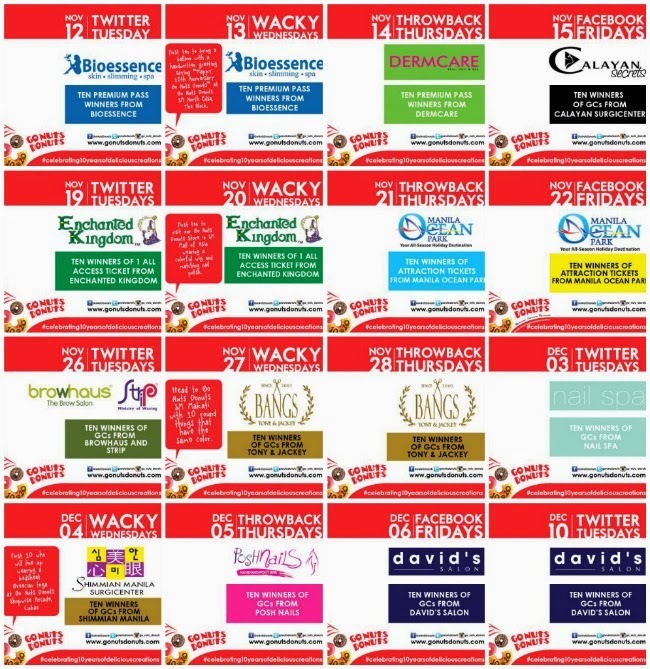 All you have to do is participate in their #TwitterTuesday, #WackyWednesdays, #ThrowbackThursdays,and #FacebookFridays promos! for more info on #celebrating10yearsofdeliciouscreations, make sure to connect with Go Nuts Donuts on Facebook, Twitter and Instagram (@go_nuts_donuts).